The recently concluded Officate Georgia program brought together over 1,600 officials for educational seminars and to hear luminaries from the sports officiating world, including retired NFL official Jerry Markbreit (who officiated four Super Bowls), Commissioner of SEC Football Officials, Steve Shaw, NCAA basketball official and 2011 Naismith Award winner, Tony Greene, NCAA wrestling official wrestling official, Bud Hennebaul, and others. Officiate Georgia, which was put on jointly by the Georgia High School Association and Georgia Athletic Officials Association, was followed this year by the National Association of Sports Officials' (NASO) Annual Summit,* which brought in an equally star-studded lineup of offiicials from the world of professional sports to educate and share ideas with youth and high school officials from around the country. This year's summit featured presentations by a particularly strong contingent of NBA officials, including Billy Kennedy, Joey Crawford, Steve Javie, and Bob Delaney, and in sports ranging from tennis to baseball to volleyball to professional rodeo. That's right: rodeo. As Tommy Keith, the supervisor of officials for the Professional Rodeo Cowboys Association. 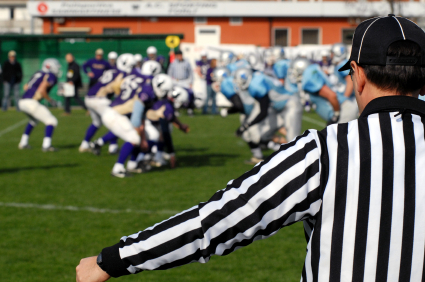 has often stated, lessons learned by officials in one sport often apply for officials in other sports, and visa versa: he can learn from such NFL officials as Jerry Seeman, Jeff Triplette, and Mike Perreira (current Fox TV broadcaster and former supervisor of NFL officials), and they can learn from him. First, they need to know that, just as with athletics, being an official requires hard work, dedication to skill development, and a never ending desire to improve. Second, if they have started officiating in a youth league, ask your state high school association if they can sit on training sessions for high school officials in your area. It's a great way to get an early start working on their game and to learn from and talk to veteran officials. You'd be surprised how many officials at the college and pro level started out as volunteers helping out in a youth or college intramural league. Finally, remind your child that, regardless of whether they are playing a sport or officiating, they can improve their skills and have fun at the same time! * A note for officials on the West Coast: the NASO's 2012 Annual Summit will be held in Portland, Oregon, following a day of training for officials in the state.